I’ve wanted one of these for ages. What can I use it for? I don’t know yet but I’m going to find out. Doesn’t it look immensely anachronistic? It’s practically surgical! What the heck do you call these little fellas? In any case I’m going to make some fabulous belts next year (hopefully) so I’ll need me some reinforced holes to poke the thingy through. 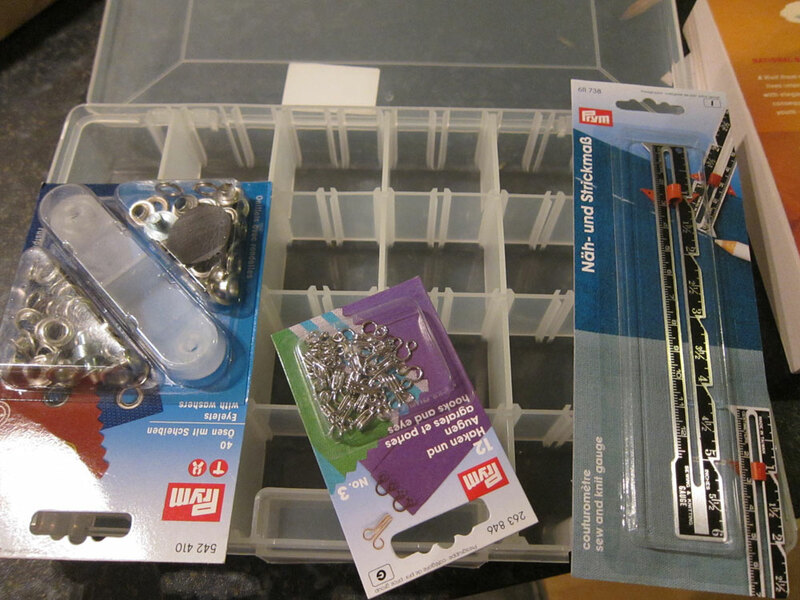 This rather ugly little compartmentalised box is going to transform my ragbag of thrifted and gifted buttons into a colour-coded haven of orderliness. That is the hope, dear readers. The reality will be three colour coded buttons in each bit and an overflowing ‘spare’ bit. But we dream. Tonight I’ll be working on the second of my mystery Xmas presents. After wrestling with the first one, punching the wall, re-reading the instructions 100 times and then working it out myself (note to Butterick – please make your ‘easy’ patterns easy to understand for beginners?) the second is proving a cinch. Hope to share the results with you next week after I present them to the unsuspecting recipients. What are you up to this week? And have you treated yourself to any new sewing gadgets or gizmos. Ooh do share – I love a gizmo. One of the loveliest things to come out of writing a blog about sewing, (apart from the community, the inspiration, the camaraderie etc etc I could go on etc) is that occasionally your friends and family read it. And then they do something utterly lovely and give you free stuff because they realise you might appreciate it, or can so something with it! I have been the lucky recipient of no less than EIGHT vintage or vintage-style dresses in the last month. One from a chum and a whole bagful from my mother-in-law, who used to collect vintage dresses from boutiques in and around Norwich. Thanks Ann and Mel! 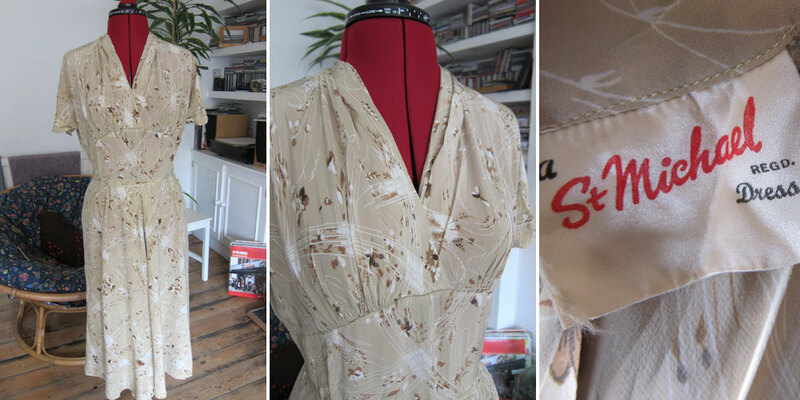 This is a gorgeous slippery little silk shift from Blanes, which according to the Vintage Fashion Guild website was ‘a very middle-range British company, active in the 1950s and 1960s – making good quality day and evening wear’. It fits like a glove. The background is much more golden than the image suggests. This will be beautiful with a little cardy and wedges come summer. This was donated by my friend Mel. I think she said her friend made it but I might have to check that out with her. In any case it’s very well made with full lining and matching covered buttons. I love the little embroidered polka dots on it and the colours are so cheery. There’s a little tightness at the bust but nothing a safety pin won’t fix. This is my absolute favourite from the whole collection. It’s one of the most elegant dresses I’ve ever laid eyes on. 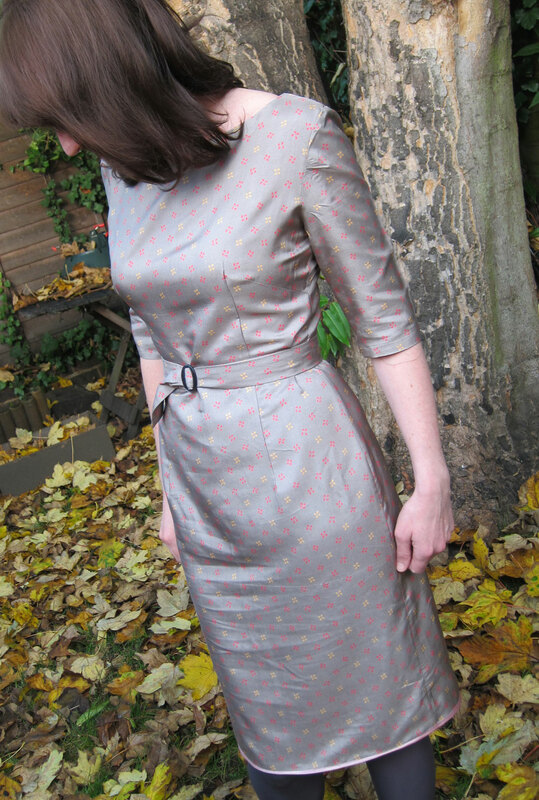 Just look at those little heart buttons and pretend bolero detail. The fabric has give, so although this dress is a little small for me (did people in olden times just not eat very much, like ever?) I can squeeze into it. I’ll need some serious foundation underwear though! Sadly there are a few holes in the dress but I’m hoping they’re fixable. Look at this little knockout! 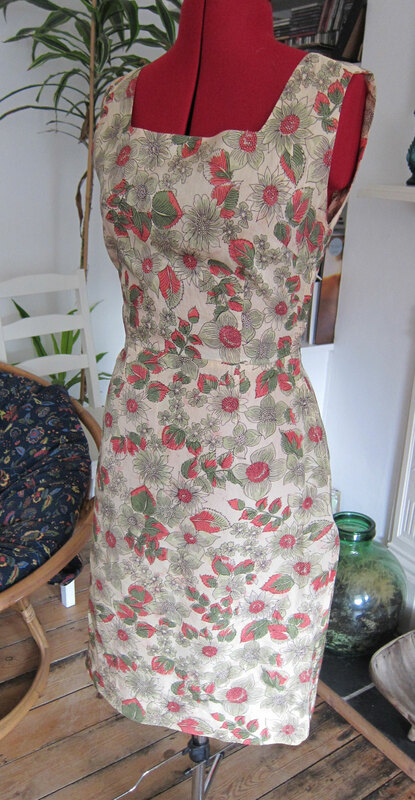 Complete with padded and underwired bosom. This is from a label called ‘Images’. I haven’t been able to find out much about it yet. Anyone recognise the name? 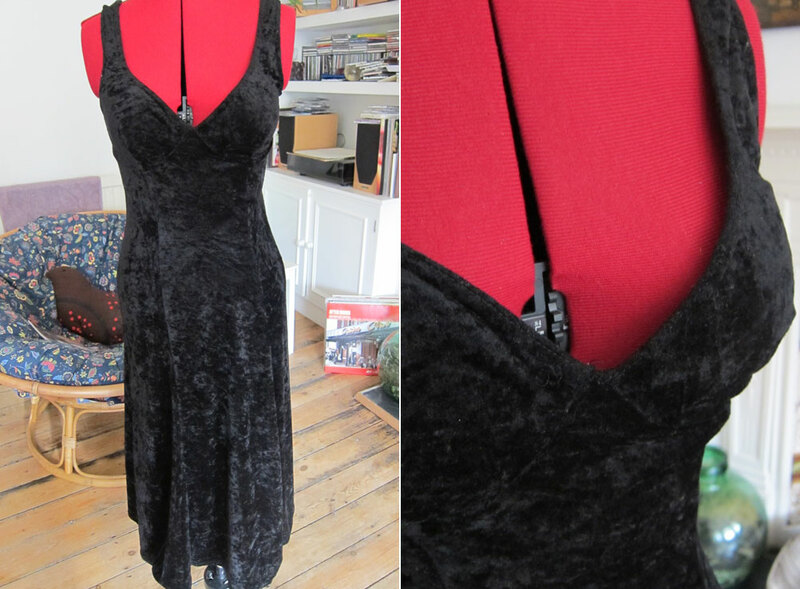 I’m finding this dress quite difficult to date but I love the crushed velvet – and that bust. Instant chest – yay! Recognise that label? Those of you old enough to remember being forced by your mother to try on clothes in the middle of high street department stores will – it’s Marks and Spencers! (How did mums ever get away with that? I never see that happening these days.) 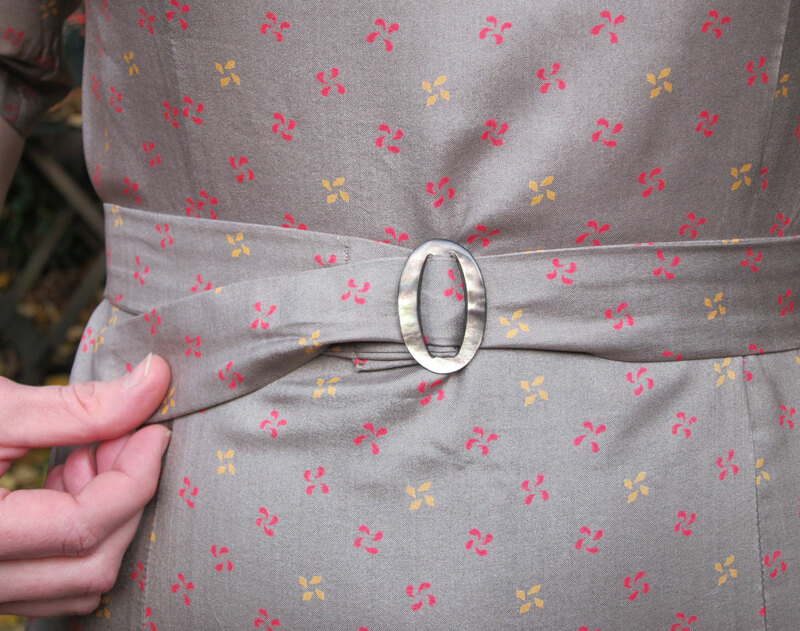 Love the pattern on the fabric – very whimsical. Not sure what kind of fabric it is though – maybe viscose rayon? Whilst the neckline and shaping around the bust is really flattering my torso is too short for the extra band around the middle so I’m going to see if I can remove or shorten that in some way. Look at this cheeky little number! It’s so jaunty and so wonderfully eighties! The fabric is awesome although I have no idea what it is – it feels like a stretchy cheesecloth – maybe crepe? As you can see from the label it’s by Carla Bower for Radley who designed for the company through the 70s, so perhaps it’s a little earlier than I first thought. The buttons are fantastic. 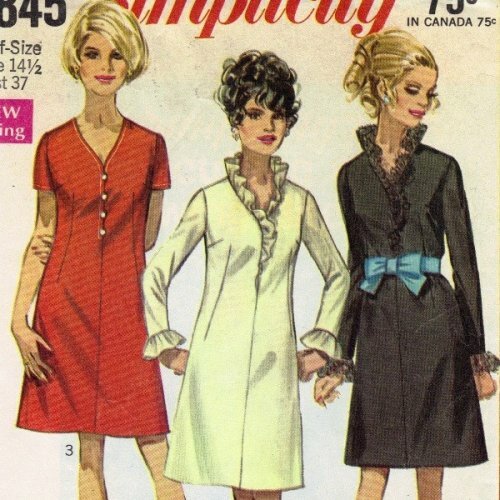 Sadly the dress is a little tight for me – I’d be worried about the buttons at the back popping open all the time. So it’s going into the fabric stash. Hopefully I’ll find something suitable so I can use both the fabric and the buttons as they work beautifully together. God I love this dress, but it doesn’t love me. It looks stunning on the dummy but I look like a sack of spuds in it 😦 It’s much too beautiful to cut into – look at all those pleats! Sigh. Maybe I need to think about this one a bit more. There’s no label on it, and every pleat has been hand sewn. Can you imagine? Love the neckline too. This one will sit like a gorgeous but untouchable goddess in the wardrobe while I figure out where to go with it. Confession: I’m a sewing stalker, a plagiarist, and a green-eyed monster. I absolutely love this pattern. It’s very Joanie, non? 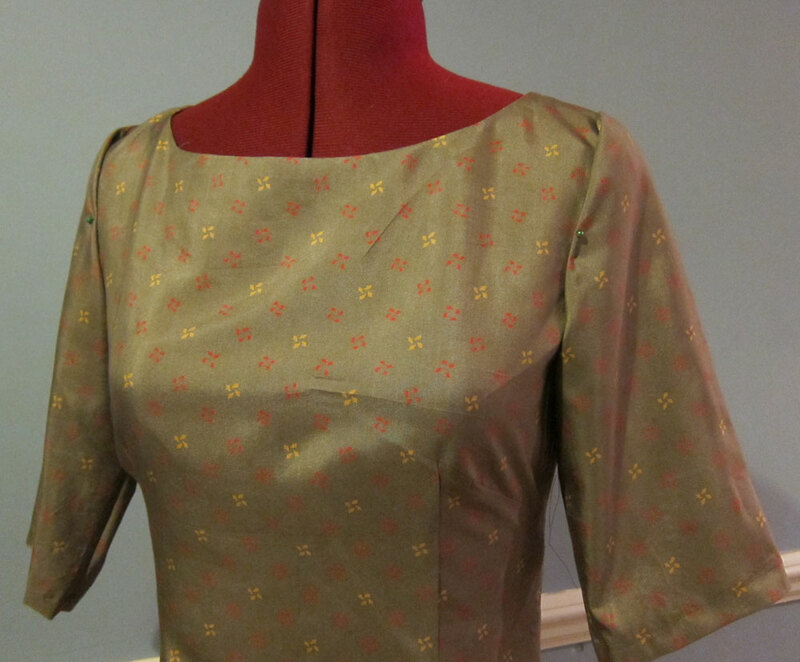 Specifically View C. I have a dark green fabric I could use for this – it may be crepe (not sure about my fabrics yet). But then I’m looking at the purple-blue colour of View A and thinking hmm might be time to hit me up some new fabric as an early Christmas present to me from me. Why, thank you me! And what about this little darling? 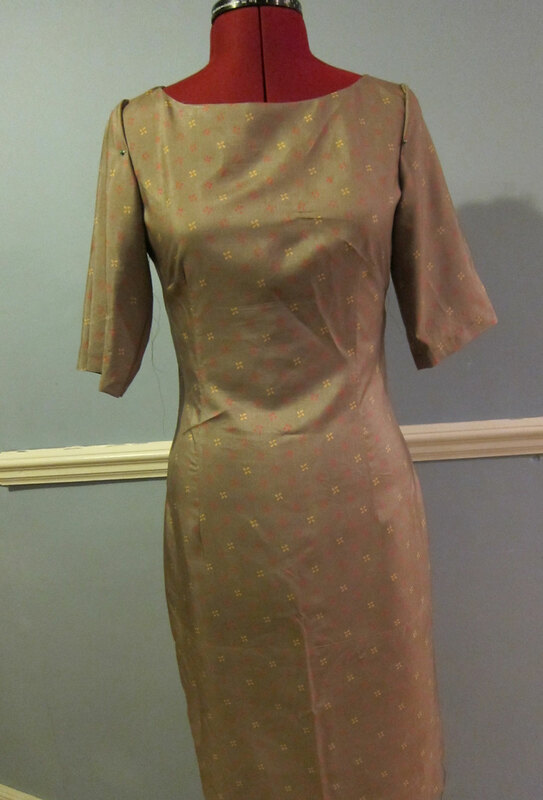 The neckline on the middle view fits all the boxes I currently adore: vintage, feminine, gamine. Ooh be still my beating heart (and related pulsatile tinnitus – more of that in another post). I found it on Etsy. Even with shipping from the US it came in around standard pattern price (about £12). I recently bought a really heavy sort of satin from Walthamstow market with a fabulous sixties vertical flower print on it. It’s almost curtain material and could be stiff enough to create a really dramatic neckline. And look at that hairdo! A dress like this requires some serious up-tresses. The sewing monster has been placated even further today – Amazon has announced it has finally despatched my Colette Sewing Handbook. I’ve waited patiently (snarled, yapped, nipped and grizzled) throughout the sweet Colette posts on the Meringue and the Taffy and the Licorice. Now they will be mine – all mine! Can’t wait to get my little paws on it. What about my UK friends? Anyone else got the book on order? Have you got your copy yet? 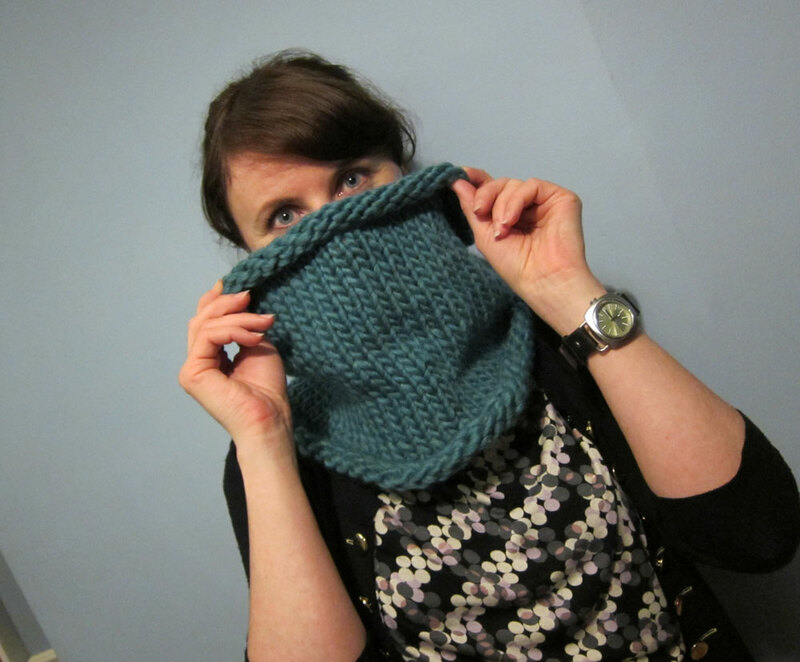 Many of you will have been following the snood-around-the-blog-world that’s been happening recently, kicked off by Did You Make That and a free pattern and taken up by countless other bloggers and knitters around the world (well, in the Northern hemisphere at least). But another very special lady has also taken up the yarn challenge. 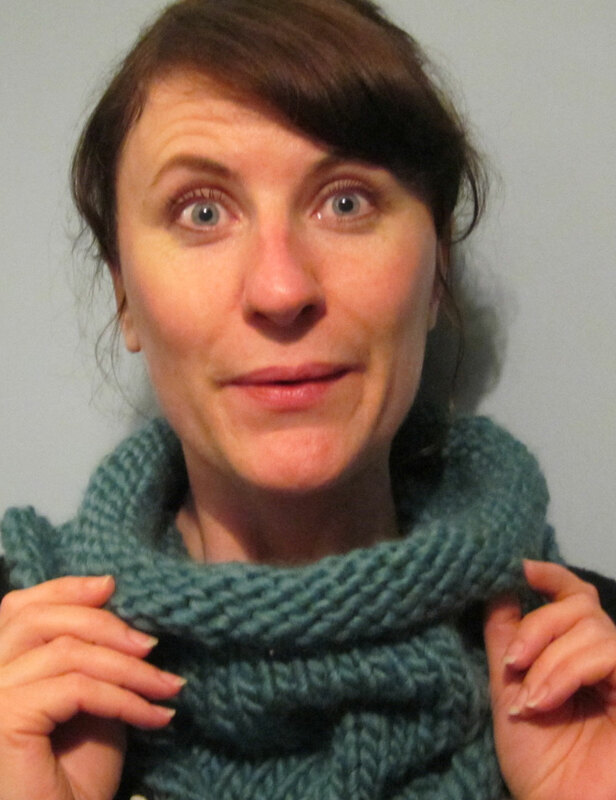 One whom none of us know much about, other than that she can knit beautifully, and she’s very generous with her time. Oh, and that she’s Handmade Jane‘s mum! Jane’s lovely mum made non-knitter Jane her very own snood. 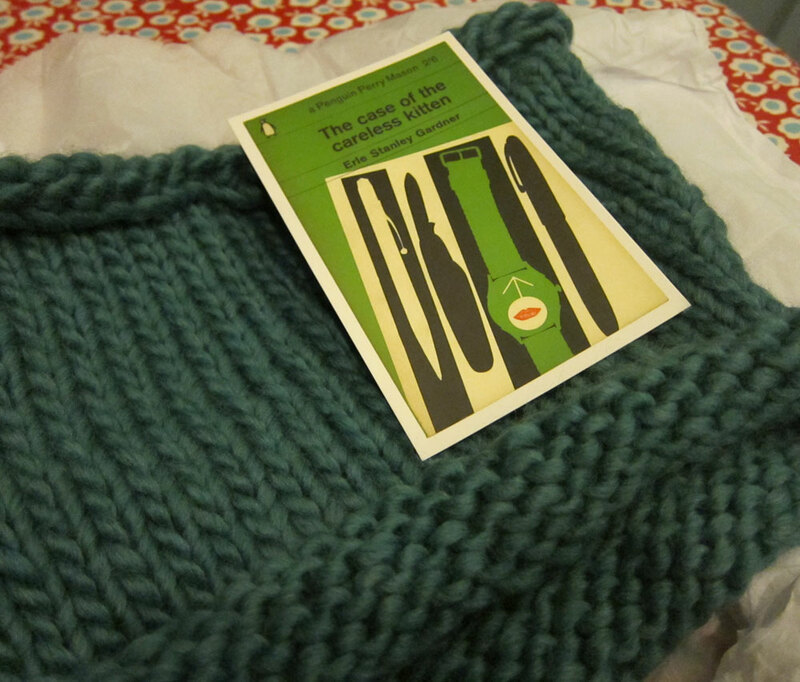 And then she made her another one, which Jane promptly offered as a giveaway on her blog. Which I won – hooray! Now I can join the snoodathon without lifting a finger. Jane’s package greeted me as I arrived home yesterday with this pretty little literary postcard and a lovely message. I absolutely love it! It’s so soft and warm. I can’t wait to take long winter walks with it. The colour is absolutely gorgeous. I think teal may be my favourite colour in the world. Thank you so much Jane and please thank your wonderful mum too. 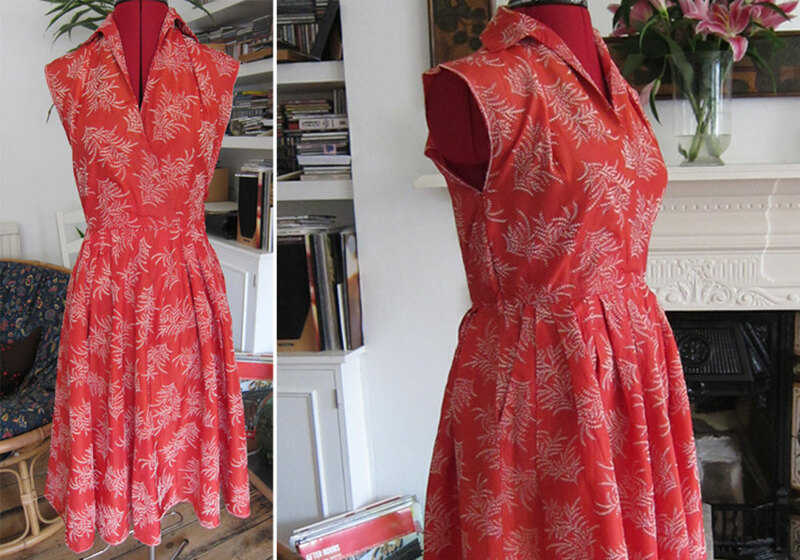 My goodness this dress is taking its own sweet time… but nearly there now. 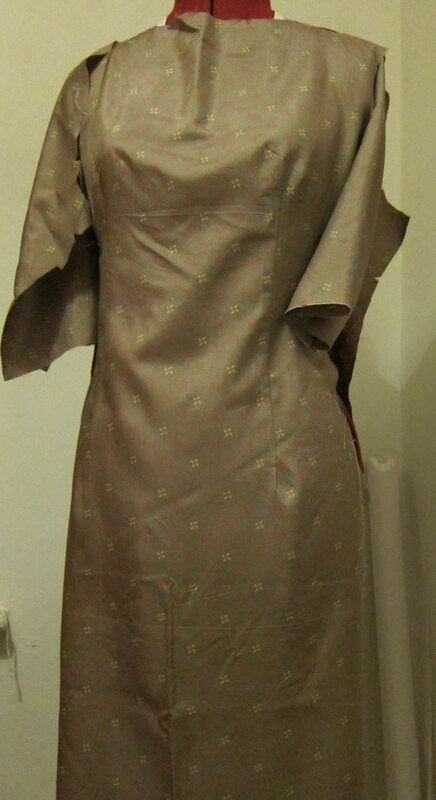 Just the sleeves and the hem to finish off. 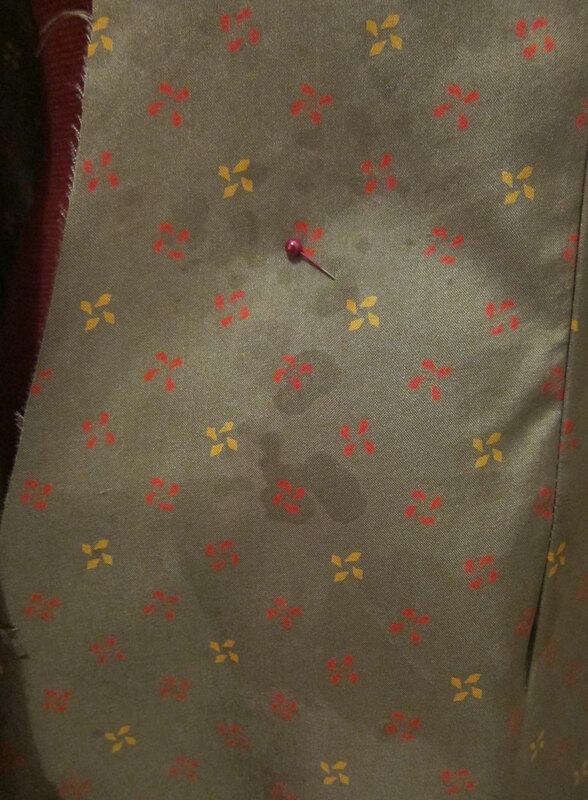 Remember I had some awful water stains on the fabric early on in this project? Well after a root around the internet for advice on removing water stains from silk, I found a great tip. Just boil a kettle and take the lid off so lots of steam is rising up and the kettle keeps boiling. Hold the stained fabric above the kettle (making sure not to get splashed by boiling water of course). The stains just magically disappear! Genius! I’ve not got rid of every single one yet though – I need a weekend and lots of daylight to do that. I’ve found the silk to be medium tricksy. No slippery ways or anything – just has a tendency to fray quite a lot. I’ve also used some of Tasia’s tips on finishing seams, although I have to say mine aren’t quite so perfect. I’ll share pics and details once it’s completely finished. Apologies for the creases in the fabric. For obvious reasons I’m rather afraid of using the iron on this at the moment! As the nights are drawing in my mind is increasingly turning towards Christmas and how ill-prepared I am. I haven’t bought a thing yet. We’re doing a not-so-secret-santa this year amongst us siblings and partners so it’s certainly easier just buying for one person instead of five (not including the husband, aged p’s and nieces and nephews of course). But I’m thinking of knocking up a few wee handmade gifts as little treats too. I’ve bought a bag of ‘flex frames’ (they’re those bendy metal snap-shut things that you get on kids purses and glass cases) so I’m thinking of doing some mobile phone covers using up some fabric scraps. Plus I’ve just bought some heat-protective wadding so maybe a pot holder/oven glove? I blame Crafty Christmas Club. I had no intention of making handmade gifts but now I feel like it’s absolutely essential! I shake my tinselled fists at you Tilly Buttons! One of my favourite parts of any project is that bit in the middle, when most of the separate pieces are done and ready to be sewn together. It’s usually at this point that I pin them to my dummy, stand back and do a little dance of glee and excitement. It’s at this point I think, that I sense the pure potential in a garment or project. It’s all made up and looking perfect in my mind’s eye (and my own, if I squint a little and shake my head a bit so the unfinished seams don’t spring out at me), and whatever little mistakes I make putting the zip in, finishing the hem, adding the facing don’t exist… yet. So stop for a moment and imagine how I felt when I saw this, late last night. 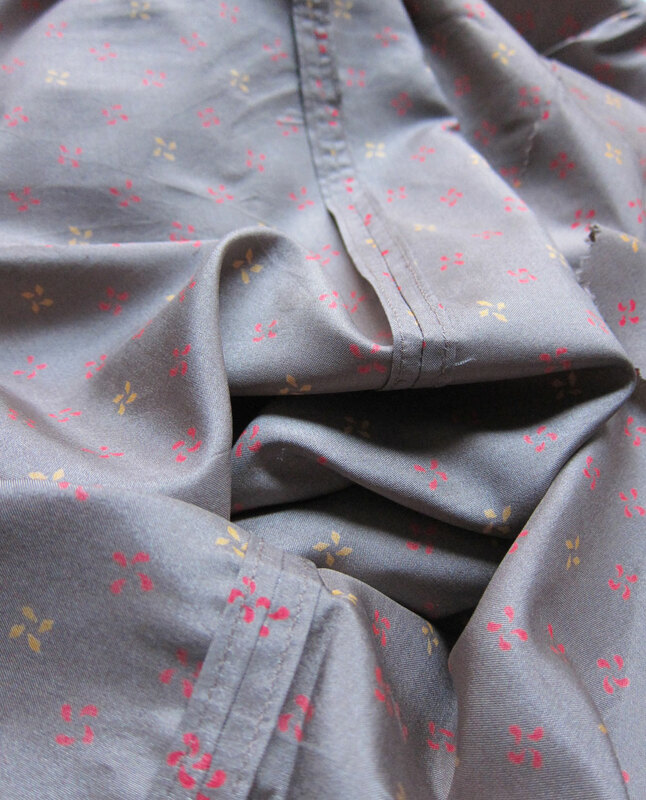 Yep – water marks on silk. 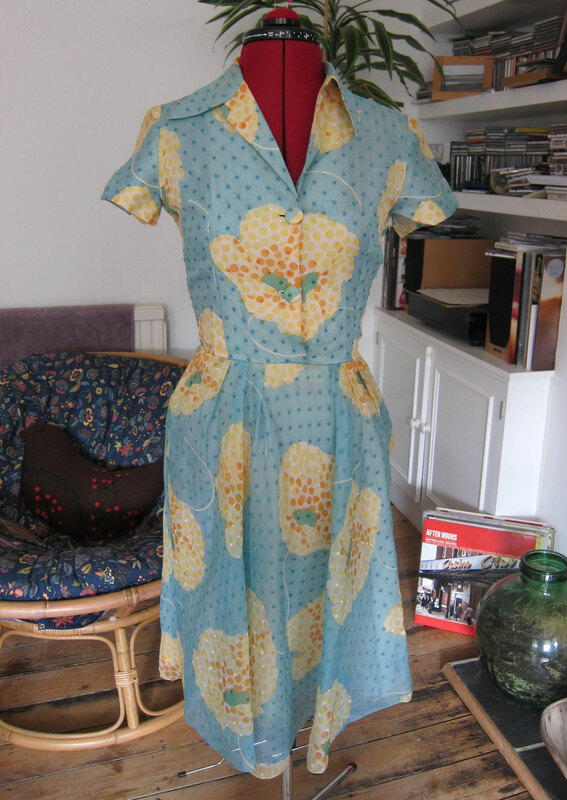 Beautiful vintage Liberty silk. How can something so innocuous do so much damage, I ask you? Any damage to the interfaced facings is fine – it’ll all be on the inside so I can live with that. But pressing the darts front and back (the iron was on a silk setting too!) inflicted the most awful stains to the dress. I’ve been researching how to remove them and I’ve got a couple of methods to try out. I’ll start from the top and move onto the next one if the previous tip doesn’t work. Rubbing the silk with another piece of silk, going in the direction of the grain. I have no idea how this will work but I’m willing to try it out. Holding the damaged area of silk above a boiling kettle so the steam removes the stain, and drying flat. Immersing the item in a lukewarm bath of water with a small amount of mild detergent, rolling in a towel to remove excess moisture and then leaving to dry naturally. Hanging my head in shame, beating myself until bloody with the damaged item and then taking to my bed with the cats for a year until the memories recede. But what is the point, dearest readers, of being part of a caring, sharing blogging community all interested in the same thing, if you can’t holla for help occasionally? Consider this a yodel. Have you ever experienced this? How did you get rid of the water marks? Do you have any tips for pressing silk, considering I still have to finish the item and put in a zip and it’s scaring me half to death? Is a year in bed truly the only way out of this? Do bedsores hurt? Help!